Seedwina is one of the Nature faeries who's purpose is to gather seeds in Autumn and sow them in spring. Every year she gently gathers the seed and put's them in special pouches. These pouches have a powerful magic because they are fashioned through love and kindness. The fairies believe that the seedlings know this and is a part of why they grow so vibrantly. Each task has a purpose as does each seed. This morning Seedwina sits atop a large toadstool while the brilliant sky lights up in a burst of color to greet a new day and new life! reaping them again with coming of fall. Seedwina's love of nature shines. She often visits the seedlings during summer, some have healing powers and are good to eat. 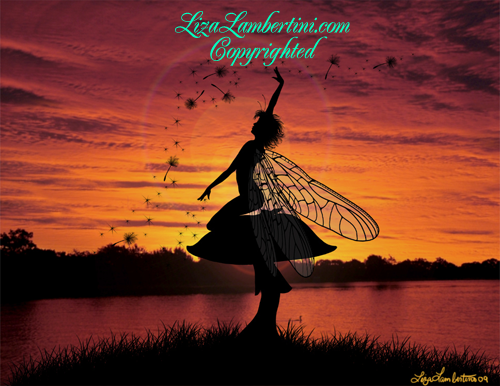 Fairies and humans both utilize the healing power of plants and flowers in their daily lives. While other types of plants and flowers attract the fairies and humans friends the butterflies, bee's and hummingbirds which are so important to the health and well being of our Mother Earth.